Cadence® Clarity™ 3D Solver is a 3D electromagnetic (EM) simulation software tool for designing critical interconnects for PCBs, IC packages, and system on IC (SoIC) designs. 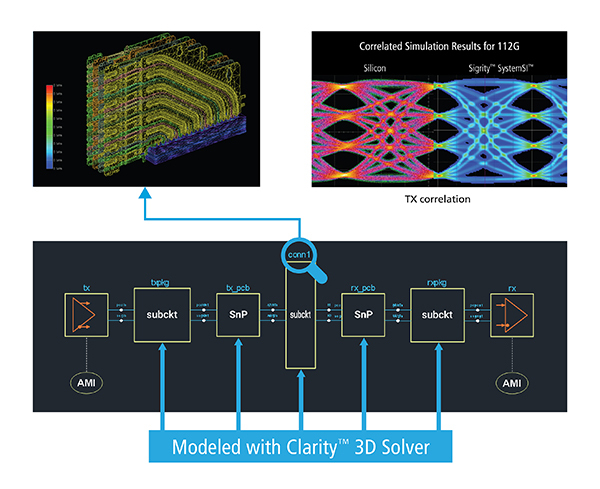 The Clarity 3D Solver lets you tackle the most complex electromagnetic (EM) challenges when designing systems for 5G, automotive, high-performance computing (HPC), and machine learning applications with gold-standard accuracy. Industry-leading Cadence distributed multiprocessing technology enables the Clarity 3D Solver to deliver virtually unlimited capacity and 10X speed required to efficiently and effectively address these larger and more complex structures. It creates highly accurate S-parameter models for use in signal integrity (SI), power integrity (PI), and electromagnetic compliance (EMC) analysis, enabling simulation results that match lab measurement, even at 112Gbps+ data transfer speeds. The Clarity 3D Solver can solve the true 3D structure by efficiently matching the available computing resources to the size of the design. Historically, large structures have been manually cut up into smaller structures for analysis using the largest and most powerful computing resources. No more. We designed the Clarity 3D Solver from the ground up to take advantage of your multi-core compute resources by parallelizing the mathematical tasks required to solve for 3D structures. The tasks can be parallelized within one computer’s cores or across multiple computers, cutting the time to solve for complex structures by 10X and even more. Industry-leading parallelization technology ensures that both meshing and frequency sweeping can be partitioned and parallelized across as many computers, computer configurations, and cores as are available. The amount of time required to solve is scalable based on the number of computer cores. If a user can double the number of computer cores, performance will be nearly doubled as well. Clarity 3D Solver EM software optimizes the connector-PCB interface and models critical 3D interconnect from TX to RX. Using web-based cloud servers to solve 3D structures can be an alternative to purchasing computing hardware. Instead of choosing large and costly servers, designers using the Clarity 3D Solver can select lower cost cloud-computing resources and still maintain the highest performance. This flexibility can produce considerable savings on the cost of cloud computing expenses when solving for 3D structures. The Clarity 3D Solver is a key component in the system design enablement methodology required by advanced electronic product design teams. With a complete design and analysis flow from Cadence, you will be empowered to create reliable and competitive products, deliver on-time and on-budget, and increase your market share.